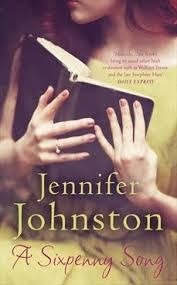 A new book from the multi-award winning Jennifer Johnston was always going to pique my interest. This novel may be short, but more than makes up for its length with the content. Annie receives a call that informs her of her father's death. She is not too surprised, or too bothered by the fact, as they have been estranged for quite a while. She ran away to London as a teenager to escape her father's domineering ways and to try and live her life to her own agenda. Now, the thoughts of returning to Dublin is not appealing and she dreads meeting her Stepmother. However, the funeral must be attended and she boards a plane to face the music. When she learns that her father has left her the family home, she is shocked and thinks he is trying to control her from beyond the grave. She goes to the house, to clear it out, and encounters the handyman,Kevin, who lives nearby with his elderly aunt. It turns out that they both knew her mother well, and as Annie has limited memories of her, she visits to piece together some information about her mother's death at such a young age. The uneasy friendship that develops between herself and Kevin becomes much deeper the more she learns about her mother, with secrets revealed, memories re-surfacing and the past being re-written. Jennifer Johnston is well known for her masterful storytelling and classical writing style. I was a little worried when I heard the title of the book, as it sounds like one of those mundane memoirs about "desperate" childhoods. The title actually refers to a song that Annie's mother used to sing regularly and which is like an ear worm for the young woman. The story is simply told but with beautiful style and finesse. Some of the phrases used by Kevin were a bit annoying as they are not ones I would ever have heard an Irish man utter. The book reads almost like a play, with four or five main characters and had echoes of All My Sons by Arthur Miller. Buried secrets which change how you view someone's character when they come to light. I would recommend this quaint novel to lovers of Colum McCann and Colm Tobin. Quality writing from Ms. Johnton, as usual. A Sixpenny Song is published by Tinder Press and is available as paperback and E-book.